On May the 4th I posted a photo on my Facebook of me in a dress, whishing everybody a happy Star Wars day. Apparently most people didn't see that I was wearing a Star Wars dress. 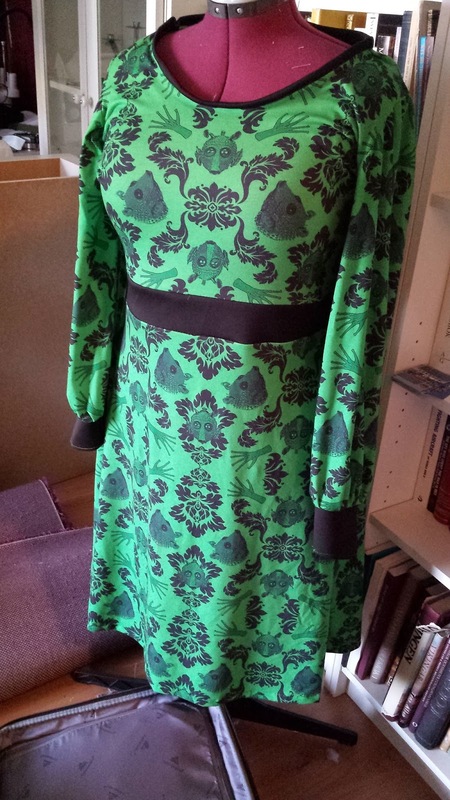 Here is the story about the Greedo dress. Back in March Holly from Sew-Nerdy posted about a very special fabric that she had designed and printed on spoonflower.com. 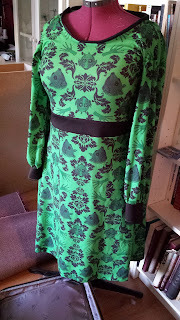 A fabric that consisted of the head and hands of the bounty hunter Greedo from Star Wars intertwined with a damask pattern. Now I'm not a big Greedo-fan like Holly, but I loved the colour, exactly the kind of green that goes really well with my current hair colour. I had to ask her about the fabric, and she was kind enough to let me make an order for th fabric. I ordered some in a jersey fabric, with a plan to make some kind of easy spring dress. I didn't have a pattern, but I have very many jersey dresses, they make up the bulk of my wardrobe. So I took one of the dressed that didn't have any darts but was just a front and back piece. 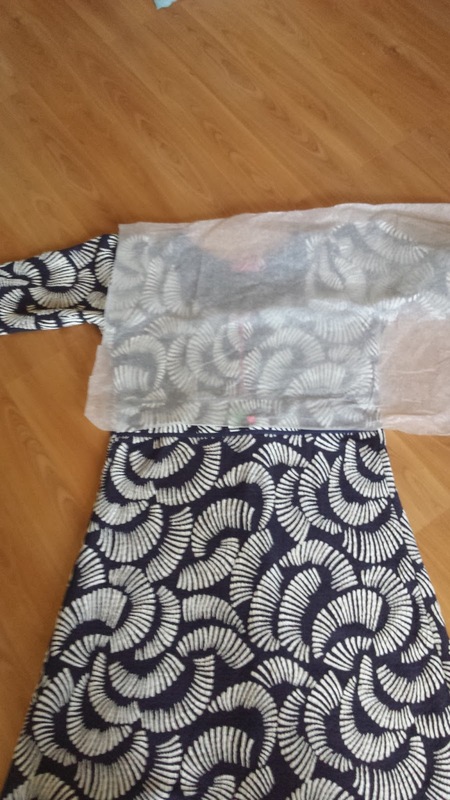 I put a piece of pattern tissue over the dress and simply traced it. Then I found a piece of black neoprene in the stash and used it as a waistband. 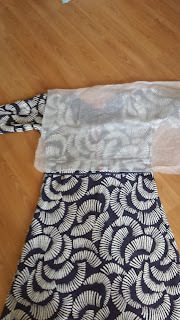 I think that was necessary since the jersey was quite thin, but the waistband keeps everything in position, so that the bodice isn't stretched out by the weight of the skirt. For the skirt I also traced the same dress as above, but the thinner jersey made it cling too much over my stomach and thighs. To solve that I ripped up the side seam and added a long gusset to each side. For the sleeves I took the first basic sleeve pattern I could find in my pattern stash, but enlarged it a lot. I didn't want the sleeves to cling at all. I finished off with cuffs and a neckband made from the same neoprene as the waistband. Now I have a fun and very comfortable dress that I can wear on everyday occasions, and people won't even know that it's a Star Wars dress. I opted for long sleeves since almost all of my bought dresses have short sleeves, and I wanted a dress that I could wear when it's colder, without having to put on a cardigan or jacket over it. I practically lived in the dress up at Nordsken, simply because it was so comfortable. Since it is a bounty hunter dress I of course had to wear it when I talked to Jeremy Bulloch. If I ever get to meet Paul Blake, the actor playing Greedo, I'm thinking of having him signing the dress and embroider it on permanently.